The L Series is the most versatile instrument that Bowman offers. It combines all of the features of the P Series with a larger sample chamber and greater X-Y stage travel. For samples larger than ~12 inches in any direction, the L Series is a must-have. The large sample stage and travel allows for both large parts, or large sample fixtures holding multiple parts, to be measured. 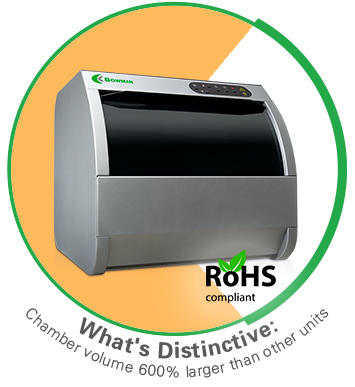 The chamber is fully enclosed and boasts a capacity to hold samples up to 22”x24”x13” (LxWxH). The X-Y stage travel distance is 10”x10”. The standard configuration includes a 4-position multiple collimator assembly, and a variable focus camera allowing for measurement in recessed areas. As with other models, the collimator sizes and focal distances are customizable for different customer applications. The programmable X-Y stage is included, but can be removed to allow for the maximum sample height capacity (10” z-height with stage, 13” without). The solid-state PIN detector is included along with our long-life micro-focus x-ray tube. The high performance SDD detector is an optional upgrade.